In this step, you will learn how activating and deactivating abstractions can be used to change the view of the model. 1. Activate the Order Processing abstraction. This can be done by double-clicking it or by selecting it and taking the Activate option from the right-click or Abstraction menus. 2. The diagram will be updated to show only the Customer, Order, Ordered Product and Product entities. 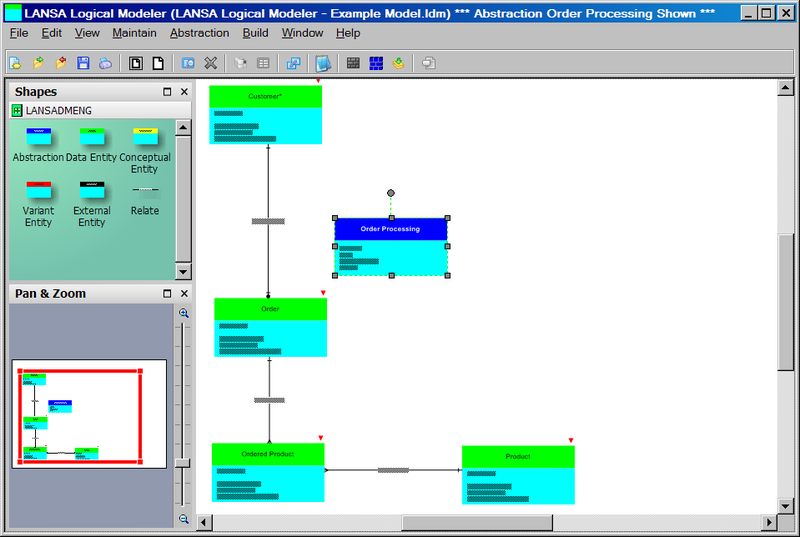 Note that the Order Processing abstraction is still shown on the diagram. Note that the navigation facilities you have learned to use in the previous steps of this exercise can be used when an abstraction is active. 3. Move the entities around the diagram. 4. Deactivate the abstraction. This can be done by double-clicking it or by selecting it and taking the Deactivate option from the right-click or Abstraction menus. Note that the entities return to their original positions. 5. Reactivate the abstraction. Note that the abstracted entities return to the positions you moved them to when the abstraction was last active. 7. The diagram will be updated to show the entire model.